I recently learned about the progress of two loggerhead sea turtles, at least one of whom was rescued on Ocracoke Island a couple of weeks ago during a prolonged cold snap that endangered or killed a number of sea turtles along the Outer Banks. Amy, David, Lachlan, Bill Jones, and I were on the beach two days ago when we noticed an unusual movement ahead of us, near the water's edge. As we approached we realized it was a seal. We backed up to give the seal space and not disturb it. Luckily Amy had her camera. She was able to get several great shots, especially with her telephoto lens. If you see the seal please keep your distance. It is illegal to approach or harass seals in any way. I was told by a park ranger that a harbor seal had been reported on Ocracoke. This fellow appears to be a juvenile. Maybe some of our readers can shed more light. On Thursday, February 23 I wrote about Richard Etheridge and the Pea Island Life Savers. Several readers have alerted me to stories about a new documentary on the Pea Island Life Savers. It is titled "Rescue Men" and will debut tomorrow night at Roanoke Island Festival Park in Manteo, NC. As many of our readers know, local musicians gather around the Community Store's pot bellied stove every Friday night from 6 to 8 pm. There is another treat in store for us on Saturday night. 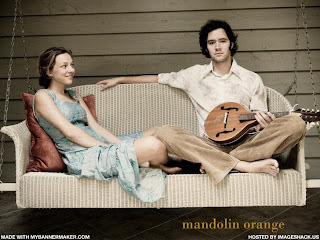 The Ocracoke Arts Council is sponsoring a free concert featuring Mandolin Orange, a musical duo who captured everyone's heart when they first appeared at the OcraFolk Festival a couple of years ago. Emily & Andrew (Mandolin Orange) will perform at the Deepwater Theater, beginning at 7 pm. If you are on the island make every effort to hear them sing and play. You won't be disappointed! "Do you ever find sea glass on Ocracoke's beaches?" Rarely, although I understand there is a fair amount of it on the northern beaches (in the Nags Head area). 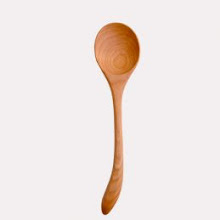 Don't know why this is so. Another reader asked if I would share more information about our local boy scout troop. I will keep this in mind for another post, or maybe even a monthly newsletter. I was asked, "Will you be at the concert [the annual celebration of the Feedmen's Colony, on Friday, Feb. 26, in Manteo]? I understand there will be a surprise guest." I doubt it. I just got back home last night, and don't want to get in a car for a while. I'll ask friends in Manteo about the surprise guest. "Where do Ocracokers generally buy things like coffeemakers or kitchen appliances, bed linens, etc.?" A few of these smaller items are available locally at the Variety Store, but most islanders shop off island (in the Nags Head, Kill Devil Hills area, or in Norfolk or Greensboro) or on-line for these types of purchases. "Is it possible to ride bikes on the beach? I've seen people riding bikes on other beaches, but never on Ocracoke." If the sand is packed down and very hard it is possible to ride bikes on the beach (I see this occasionally), but there are usually soft places at frequent intervals, so it's generally not much fun. "Are there nice, sandy beaches on the sound side of the island, or are those reserved for the ocean side?" Not really, although there are a couple of small beaches that are not easily accessible. Most of the sound side is shallow, marshy, and hard to get to. "The map you have on your website "The Complete Illustrated Map of Ocracoke Island" ... is that a modern-day or historical map?" Both. It shows the present day boundaries and modern landmarks, but it also includes the historic (and often unfamiliar) place names for many areas of the island. "Where do people go to watch the fireworks? The life-guarded beach? Can they be seen from the village or do the trees obscure the view?" It is highly unlikely that Ocracoke will have any fireworks displays in the near future because of the explosion and tragedy last 4th of July. In the past they were launched behind the NCCAT (old Coast Guard) building, and could be seen from anywhere in the village. I hope this helps. Post more questions if you like. I'll answer as best I can. Yesterday I mentioned the book, Fire on the Beach, an account of Richard Etheridge and the Outer Banks' only all black life saving station. Today I call your attention to the Roanoke Island Freedmen's Colony. This little known community, which was established on Roanoke Island during the Union occupation of the Outer Banks early in the Civil War, was home to thousands of former slaves. Forgotten by most historians for many years, renewed interest in the Freedmen's Colony began nearly 30 years ago. Today a web site, http://www.roanokefreedmenscolony.com/, presents a history of the colony with documents, maps, and much more. Moreover, on February 26 the 2010 annual celebration of the colony will be held at Roanoke Island Festival Park in Manteo, North Carolina. There will be a blues concert, play, and more (please confirm details, dates and times with Roanoke Festival Park). If you are in the area consider making time to learn about this intriguing part of Outer Banks history. A couple of years ago I read a fascinating book about the Outer Banks. Every so often I think about it, and I often recommend it to friends and acquaintances. It is titled Fire on the Beach: Recovering the Lost Story of Richard Etheridge and the Pea Island Lifesavers, and was written by David Wright and David Zoby. Fire on the Beach tells the remarkable story of Richard Etheridge an African-American Outer Banker who was born into slavery, served in the Civil War, and later entered the US Life Saving Service. He eventually became keeper of the only all black life saving station at Pea Island, on the Outer Banks. His story is rich in history, drama, and insight about the life saving service and distinguished black residents of coastal North Carolina. Many of our readers know that needed repairs have been made to our beloved Ocracoke Island lighthouse (see our posts for December 15, 2009 & January 22, 2010 for photos). Our latest Ocracoke Newsletter is the story of Ocracoker, Kelly O'Neal, and the 1951 revolution in Siam (Thailand). 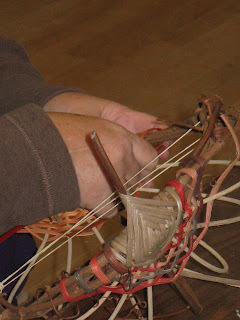 You can read it here: http://www.villagecraftsmen.com/news012910.htm. 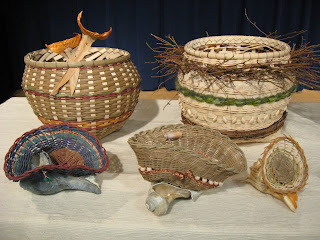 Last week Judith Saunders, resident of Virginia & Ocracoke and award winning artisan, conducted a week of classes in basketry techniques on the island. 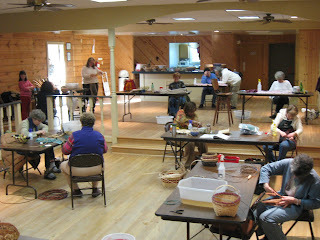 Fourteen people participated, including first time basket makers and more experienced weavers. 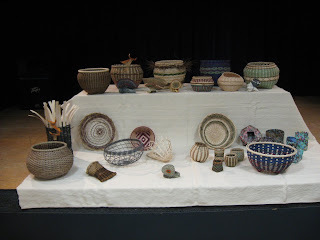 Some of the baskets created were traditional, using both natural and dyed reeds. 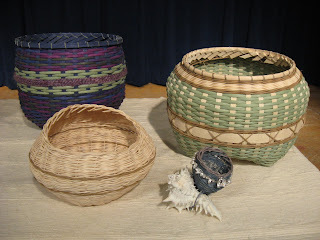 Other baskets used locally harvested natural materials, including Ocracoke seashells. My daughter Amy served as student assistant. The class was funded in part by a Grassroots Grant from the North Carolina Arts Council, with funding from the State of North Carolina and the National Endowment for the Arts. Administrative support for the grant funding came from the Beaufort County Arts Council. Amy was walking along the beach several days ago when she spotted a coin. Reaching down to pick it up she was hoping to find a collectible silver or gold piece, maybe even pirate booty. But it was only a quarter. However, she did come across several natural objects worth picking up and photographing. 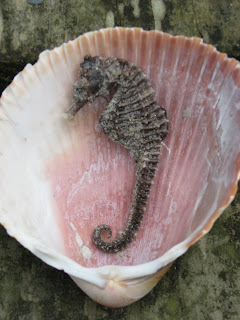 Below is the sea horse she discovered washed up at the high tide line. Once in a while I'll notice sea horses swimming near the docks in Silver Lake Harbor, but I can't remember ever finding one on the beach. She also gathered a number of colorful crab shells. 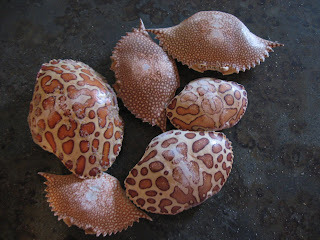 These are common on our beach, but noticeable because of their patterns and hues. On Ocracoke Island be careful where you step if you venture away from the beach and off the beaten path! You might have an encounter with one of our cacti, called locally the "pickle pear." 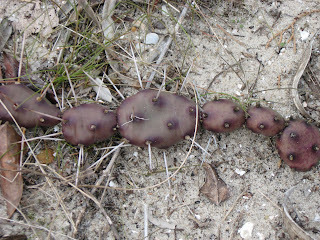 More commonly referred to as prickly pear cactus, they have sharp, smooth spikes that can pierce canvas shoes, and finer, hairlike spines that will detatch. Both can cause painful injuries to bare feet. 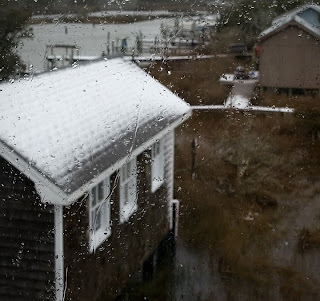 Many Thanks to George Brown who has sent me two of his recent photos of the recent snowfall in Ocracoke! You can see more of George's Ocracoke photos on his blog, http://www.pixadilly.com/. Be sure to use the "previous" and "next" links to view all of his entries. For generations weather has played a major role in the life of Outer Bankers. Hurricanes, storms, shipwrecks...these have all shaped the history of coastal North Carolina. In 1871 the US Weather Bureau established the first coastal observation station in North Carolina at Wilmington. A station at Cape Hatteras was established three years later. Over the next decade stations were set up in a number of other locations along the coast. No weather station was ever built on Ocracoke. Before telephones and other advances in communications, announcements of impending storms were delivered to the island in sealed tubes dropped from airplanes. In 1901, for just over $5,000, the US Weather Bureau built a new station on Hatteras Island. It was commissioned on New Years Day, 1902, and operated until 1946. Only three original weather stations remain in the United States. 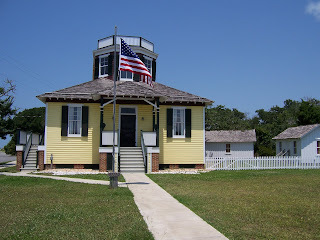 The Hatteras station in the only one that has been restored to its original condition. The station was reopened in 2007 and today is operated as a Welcome Center. The Center is located in Hatteras Village, next to Burrus' Red & White Grocery, and is open March - December from 9 am to 5 pm (closed Thanksgiving Day & Christmas Day). For more information call 877-629-4386 or 252-986-2203. I spoke with Amy & David earlier this morning. They told me that about an inch of snow fell in the village overnight...but as is so typical, there is only patchy snow on the ground, and since the temperature is above freezing it won't last long. 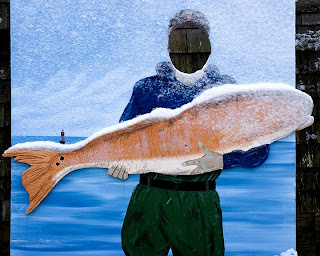 It seems like folks have been eating their way through the winter here on Ocracoke Island! Tomorrow (it's Valentine's Day, of course) the Ocracoke United Methodist Women will be offering a Roast Beef Dinner at the church rec. hall, starting at 12:30 pm. There will be roast beef, potatoes, gravy, green beans, rolls, and baked goods. Come on out and enjoy a delicious dinner and time to chat with neighbors...or carry your dinners home. It's your choice. Here I am in Indiana, watching snow flurries, and I learn that folks back home at Ocracoke are expecting 1-4 inches of the white stuff this evening. A couple of days ago high winds drove water over the highway, and shut down the ferries. It looks like the entire east coast is feeling the effects of this crazy February weather! This winter scallops have been thick in Pamlico Sound. Even if you don't wade out into the water you know there are scallops because Highway 12 is littered with broken shells. Sea gulls have learned to pluck the scallops from the shallow waters, carry them high into the air, then drop them (on the hard packed beach, or on the paved road). Cautious motorists avoid the shells whenever possible because the sharp edges often cut rubber tires. Earlier this winter word spread that authorities were refusing to open a season for scallops. Local fishermen and residents were frustrated because the scallops were so thick...and had already spawned. But on the day I left the island I learned that a season had been opened. Commercial fishermen can now harvest scallops on weekdays; recreational scallopers are limited to weekends. Be sure to check for other regulations. I may not be basking in the sun on some tropical isle, but the views around this small Midwestern town are Norman Rockwell beautiful. Lou Ann snapped this photo when I took a break from shoveling her walkway (Mostly I don't use a shovel. At the first sign of snowflakes I get in my car, drive to the nearest store and buy a case of Miller Lite. Then I carry it to the neighbor next door. He has a snow blower!). For Christmas David's parents gifted me with a book titled "Sign Spotting." It includes photos of humorous signs from all over the world. Most of the foreign signs are funny because English is not their first language (e.g. "Beware of Invisibility"). The U.S. signs bring a laugh "just because" (e.g. "Handicap Restrooms Upstairs"). Amy commented that Ocracoke has a pair of signs that warrant inclusion in the book. She sent me a photo she took (from right past the Slushy Stand), but it might be difficult to read the signs. The one on the left reads "Work Zone, Stay Alert." The orange one just across the street says "End Work Zone." Our latest Ocracoke Newsletter tells the story of Ocracoker, Kelly O'Neal, and the 1951 revolution in Siam (Thailand). 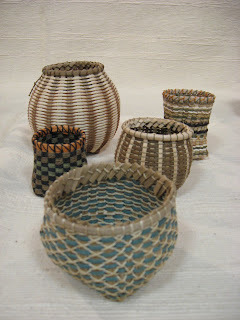 You can read it here: http://www.villagecraftsmen.com/news012910.htm. 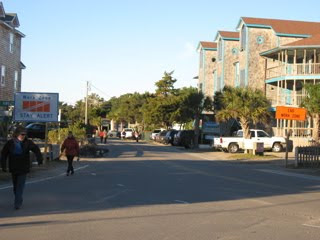 Visitors to Ocracoke often ask us residents where WE go for vacation. The answer, of course, depends on whom you ask, but most of us take time away from the island in the winter months. Some travel to warm islands in the Caribbean. Others fly to Central America, Europe, or more exotic countries in Asia or Oceana. Some hunt in Montana. Still others book cruises to Alaska. Many visit family and friends throughout the United States. Some simply enjoy Ocracoke in the quiet months of the off-season. In recent years I have made several trips each winter to visit Lou Ann in northeast Indiana. I am there as I write, having left my house in the care of Amy & David and my brother & his girlfriend. I will share some of our plans and adventures these next couple of weeks...and I will keep you updated about island life as I hear from family and friends back home. Here are a couple of photos our friend Fred Wooley took of Lou Ann and me at Pokagan State Park. We like to spend time there hiking in the woods. This time Fred loaned us some snow shoes. You can click on a photo to see a larger image. As regular readers of this blog probably know, I love to read (though I often read special-interest non-fiction). I recently completed The Forsaken, a disturbing story of the many Americans who emigrated to the Soviet Union during the depression, and who ended up in concentration camps in Siberia, abandoned ("forsaken") by the US government. I also read recently The Boy Who Harnessed the Wind, an uplifting story about a 14 year old boy from Malawi who built a windmill from scrap wood, metal, and old bicycles to provide power to his small village. Anyway, I thought our readers would like to know a little history of our local library. As early as the 1930s Ocracoke had a small library associated with the schoolhouse. There was even a mobile unit at one time. During the 1970s a trailer was installed near the school to house library books. By 1976 Hyde County opened an 8' x 10' one-room library behind the Fire House. It was said to be the smallest public library in the US, with just 3000 volumes. Marguerite Boos served as librarian until it closed in 1996, the year that our new Ocracoke School and Community Library opened its doors on the Back Road, across from the Coffee Company. Be sure to stop by and check out a book the next time you're in the vicinity. Small town America, by some measures, is much the same across the continent. Small towns, villages, and hamlets in the United States take care of their own. Ocracoke is no exception. Native islander, Tina, who suffers from MS, is now awaiting adult stem cell therapy. Neighbors have responded generously by filling donation jars placed in local businesses. On Saturday, February 6, from 4 - 6 pm, the Ocracoke Methodist Church will host a benefit dinner of seafood gumbo, rice, green salad, and soft drink. If you live on the island, or are visiting over the weekend, please stop by to show your support, and to enjoy some yummy island fare. Old time Ocockers almost always included light (or lightning) rolls (or "biscuits") in their meals, at least in the warmer months. And I've been having a hankering for some Ocracoke light rolls for some time. "Take four cups flour, 3 tablespoons sugar, 1 1/2 teaspoons salt, 1 1/2 cups Crisco. Melt 1 yeast cake in warm water, let dissolve, work dough, let stand until it rises. Then make rolls from the dough. Next grease pan and put rolls in the oven [400 degrees for 15-20 minutes]. Let cook until golden brown." I made a batch a few days ago, and was reminded why the old timers didn't make them much in the winter -- it's difficult to get the dough to rise in a cold house. I set my bowl above the gas log stove, but still they weren't quite as "light" as they might have been. They still tasted good, though! Doors to the hall open at 11 o'clock...but don't wait too long, or you might miss out! On Thursday afternoon last week I stuffed a plastic bag in my pocket, backed my pickup truck out of the yard, and headed for the Pony Pen beach. I walked across to the water, then set out for about two miles...first south along the tide line, then turned north and walked back farther up near the dunes. I only glanced out at the ocean occasionally. The surf was rough, and there was no chance of seeing dolphins. I was searching for trash. Below is a photo of what I found...a barnacle encrusted scotch bonnet, and a broken piece of a glass jar. I wondered where the broken glass had come from. The edges were still sharp, so it hadn't been there long. Regardless, I was encouraged to be reminded that Ocracoke's beach is remarkably clean. Early yesterday afternoon (starting at 12:30) Jason's Restaurant hosted a spaghetti dinner to benefit the Ocracoke Boy Scout troop. Jason's is normally closed on Sundays, but they opened their kitchen to the Boy Scouts who helped prepare, box, and sell the dinners. For $8.00 you could get spaghetti with marinara; for $10.00, spaghetti with meat balls. Garlic bread and a soft drink was included. On a cold winter day the dinner was an opportunity to get out of the house, chat with friends and neighbors, and enjoy a delicious meal without the work of preparation and clean up. And, of course, it was all for a good cause. Congratulations to the Boy Scouts for a successful fundraiser!